I’ve never been too far away from water. I was born in a seaside town in the Southwest of England (Torquay, Devon), but spent my life growing up around the world to Diplomatic parents. Malaysia, Romania, England, Seattle, Bulgaria, and where I went to Boarding school – the UK at age 8. At least we DID have a swim team. I recall we used to do ‘sponsored swims’ to raise money for stuff (like a new pool). We’d do a relay and keep (at least someone) swimming for a week. My shift seemed always to be at 2am. I wasn’t sure the teachers were paying attention to count my laps. In the UK, they had the ASA Awards to test survival swimming skills. You’d have to swim a certain distance with clothes on, tread water with your hand up, etc., getting progressively harder as you went along. I was the youngest to get through Bronze, Silver, Gold all the way to “Honours”, with a “u”. I left that school at the age of 13 with most of the pool records, except for Backstroke. But, none of it was pretty. In our equivalent to High School, I rowed. You call it “crew”. At 6’-3” and “14 stone”, I was in the powerhouse of the eight. We didn’t have much of a pool, let alone a swim team. Once a year we would have “Inter-House” tournaments for swimming (think Hogwarts without the quidditch), but, with only two or three boys who had any actual swimming ability, we would face the same opponents in every other event. In my last year, I think I broke something like 15 records, was given “House Colours”, and got to wear the esteemed Colored Blazer. Thereafter, rowing propelled me forward through Architecture School at Oxford Brooks University. I was invited to join the Leander Club – the breeding ground for the British Olympic rowing team. Alas, I missed going to the Under 23 World Championships by just a few seconds, and after College ended my rowing career. That’s when I found Triathlon. But that was it;. I realized I could actually swim. That’s when I joined US Master Swimming. Five years ago. It’s been a blast. 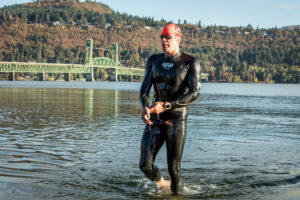 Living in the Gorge–windsurfing, mtn/road biking, kiting, and even some rowing– and now triathlon and open water swimming (OWS). Sandi Rousseau, and the Columbia Gorge Masters team, are terrific. Bob Bruce and the Elk Lake summer swims are epic. Pre-USMS, in that 23-year period, “swimming” meant going to the “Y”, swimming 1,500 meters straight, and getting out. Boring. Not. Any. More. Morning workouts are to a different “daily recipe”. I am now undefeated at the Aluminum Man Triathlon swim. I chuckle, as a half-muggle-Brit, to have become an “All American” for winning my age group at the 10km National Championships two years ago. I can’t make all the regular Oregon swim meets, but have enjoyed the summer OWS events, ePostals, and we’ve got a good thing going with OWS in Hood River during the summer. We swim out along the HR Bridge all summer long, and do a “Mosier to HR” (8km) swim a couple times a year. As “Director Svim” of the Tri Club, I even organize an upstream “Salmon Swim” in the fall, and an epic 8 mile “ ’Round Chicken Charlie Island”. Join us. I can’t get my three kids (12, 16, 18) to join me in the water, but my wife, Carolyn, started swimming two years ago in order to complete a Sprint and then Half-Ironman tri. She and I are currently training for IM70.3 triathlon in Coeur d’Alene this summer. And I am training for something called a ‘Bridge Swim’. 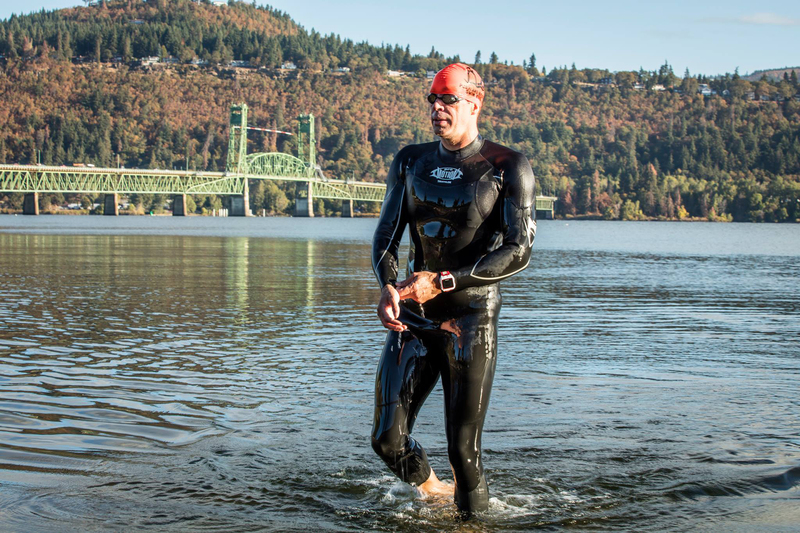 Great profile spotlight, and inspiring story of a life on and in the water. The rest of us in the Gorge are always proud to swim in your wake, Mark. May I suggest Bob Voll for the swimmer spotlight. He is a rapid upcomer and will be significant in the OMS and USMS. top 12 and 10.